John Watson, Listening to Islam with Thomas Merton, Sayyid Qutb, Kenneth Cragg and Ziauddin Sardar: Praise, Reason and Reflection (Brighton: Sussex Academic Press, 2005). How is the post-secular pluralist west to make sense of Islam? There has been, of course, ongoing interaction between Christianity and Islam since the 7th century of the Common Era (CE). But, in the last few decades Europe (and even more so North America) has had to deal with the increasing reality of Islam. Europe has been much more at the forefront of engaging Islam than has been North America, but since 9/11 North America has had to face the growing presence of Islam in a much more thoughtful manner. Jesus gives us an alternative to violence. Forgiveness. Jesus didn’t just theorize about it, he lived it. On the cross Christ made his message credible. He lived it all the way to the end. And calls us to follow him. I believe most of us long for it to be true. We long for the Jesus way to be the beautiful alternative to the ugly way of violence. Romanticized violence can be appealing—imagined musketeers and Hollywood shoot ‘em ups—but real violence is always ugly. In a world awash in endless cycles of violence we know it’s appalling and we wonder if the beautiful way of Christ is a viable alternative. I’m your neighbor, the boy next door, the guy around the corner, the dude down the street. From the outside, I might look unapproachable- like those guys on FOX news. But, on the inside, I’m a lot like you. I have fears. I have disappointments. I want my kids to go to good schools and do well. I want them to grow up and be fulfilled. I want them to be good people. I want to please God. And I think I have the list memorized- what to do, what not to do, but I can’t keep up. On the outside, I try to be sure everyone knows I am religious, but on the inside I know that I’m no better than anyone else. I bow down in prayer 5 times a day, but when I’m there, I feel so alone. I don’t think I can’t keep this up. I’m lost. But I don’t see any other way. I don’t see any other option. If someone would just help me understand how to deal with how I feel and the struggles that I’m facing, I would listen. The problem is, you are a 100 million miles away. But not just geographically, religiously and culturally as well. Everything I have been told about your religion tells me that you are completely wrong. In fact, for me, to honor God is to be nothing like you. And everything I see on TV from your culture is totally offensive. You know, I once met a man from your country. And he gave me some religious materials, but I couldn’t read them. And all he kept saying was I should “get saved” and be “cleansed by the blood of the lamb”, but I didn’t understand him. In fact, he only spoke in English, so it was hard for me. Honestly, I was hoping that he would help my family. You see, we are really struggling financially. My family is also suffering from the same sicknesses over and over again and we don’t even know why- we have no health care. And my kids are not in school. They have to work to help us. But, if you would just reach out to me and cross some of these barriers that stand between us…then maybe we could talk about this gap I feel between God and I. And if you would just help me understand how to bridge that gap and Who this bridge is…then, perhaps, I might walk across that bridge, as well. Larry Dixon and I were once friends and colleagues doing evangelism together on the streets of West Berlin in the early seventies. I eventually wrote a novel based on that experience (http://chrysaliscrucible.blogspot.com/) that treats in part this theme. One may in fact detect an uncanny likeness to Larry in one of my novel’s characters. This response to his latest book, Farewell, Rob Bell, is an invitation to renew our dialogue. Perhaps Larry would also be open to discussion around Kevin Miller’s upcoming documentary, Hellbound? The book is the author’s second go at hell. Larry argued in his first book on the doctrine of hell that there is not Good News, period, but there exists as “gospel” supplement “The Other Side of the Good News”, the book’s title. I believe Larry is right: there is another side, and it is indeed “hell”. Only this is not a hell of God’s doing, but of human postulating. As C.S. Lewis expressed it in The Screwtape Letters: “There are two kinds of people: those who say to God, ‘Thy will be done,’ and those to whom God says, ‘All right, then, have it your way.’ ” It seems Larry would “have it his way” and hold out for a teaching on a “hell” of “eternal conscious torment”. The reason that mature thinkers root and ground themselves in the fullness of the Great Tradition of Christian thought is simple yet often ignored. There is an animated and thoughtful dialogue that has taken place within the history of the ‘one, holy, catholic and apostolic church’ about a variety of perennial issues, and the means used to reach conclusions and conclusions reached are not always one and the same. The Great Tradition has many traditions, and each tradition can, sadly so, slip into a sort of mindless traditionalism. Many are either born into a tradition or come to the faith journey within a tradition that is merely part of the Great Tradition. The danger, of course, and it is a perennial one, is that many often shrink their understanding of the Great Christian Tradition to the tradition that they assume is the fullness of faith. This is like taking a leaf on a branch on a trunk on a tree in a forest and calling the leaf, branch and tree one sits under the forest. Or, to change the metaphor, many assume the watery stream they sit beside is the only river that flows from the great ocean of faith. Ron Dart and Brad Jersak, George P. Grant, Canada's Lone Wolf: Essays in Political Philosophy. Abbotsford: Fresh Wind Press, 2011. 120 pp. What is liberalism, and what conservatism? Over time, these terms have degenerated into clichés useful mainly for mudslinging and fingerpointing. George Grant, in his brief and enigmatic Lament for a Nation, articulated a vision of what "liberal" and "conservative" essentially mean. His open, suggestive style of writing, however, leaves room for a wide and healthy variety of interpretation. In their new book of essays, George P. Grant, Canada's Lone Wolf, Ron Dart and Brad Jersak help clear the air by introducing and then analyzing the ideas, or perhaps more accurately, the proposals of Canada's great philosopher. Western civilization has always had two competing sacred texts: The Iliad and the Bible. We have long pretended we can form a nice synthesis of the two—that Homer’s Achilles and Isaiah’s Immanuel are somehow compatible ideals, but they are not. The rage of Achilles and the peace of Immanuel are fundamentally contradictory visions for the ideal of humanity in general and of manhood in particular. Those who derive their ideal of manhood from the pagan vision personified in Achilles will never be able to reconcile it with the ideal of manhood depicted in Christ. 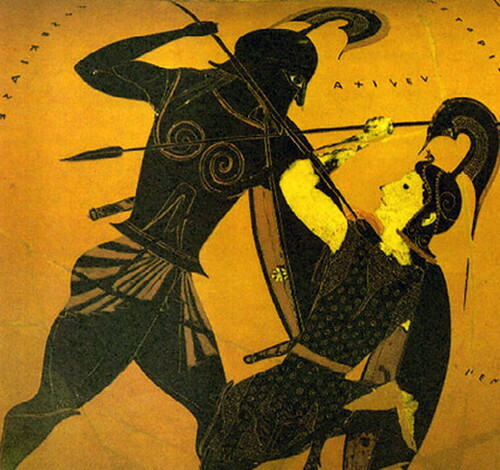 Achilles or Christ? Who is our model of manhood? We must choose. We must choose between the brutal way of Achilles and the peaceable way of Christ. And if you feel compelled to appeal to the whip-wielding Christ in the temple as an attempt to synthesize the two, let me simply say that Christ cleansing the temple is a world away from the violence of The Iliad that dominates imaginations from Homer to Hollywood; i.e. Jesus’ prophetic protest against religious exploitation is no endorsement of a “Walker, Texas Ranger” version of Messiah! Compassionate Eschatology is a collection of diverse scholarly essays exploring the relationship of eschatology (‘end times’ theology) and Christ’s teaching on peace and reconciliation. The book gathers writers from across the theological board, including Lutheran, Anabaptist, Orthodox and Catholic traditions to address themes in a sort of peacemakers guide to the apocalypse, divine judgment and the Book of Revelation. The compilation is unique in that it takes a specifically Girardian approach (i.e. Rene Girard’s mimetic theory) to theology, culture, advocacy and the environment. It features enormous breadth, from Hardin’s study on First Nation prophecy to Barbara Rossing on global warming to Andrew Klager’s recall of Gregory of Nyssa. The studies on the Book of Revelation were very good summaries of some of the authors’ (notably Grimsrud and Bauckham) previous non-violent treatises on the Apocalypse. While I am sympathetic to Weaver’s Anabaptist interpretation, I don’t know that these expositional chapters were sufficient to break the impasse with previous challenges of objectors (esp. Miroslav Volf). Nevertheless, the book as a whole certainly did accomplish its objective in reorienting our view of the future towards Christian hope. One essay after another offered an alternative vision to the doomsday gloom of the rapturists’ ‘hell-in-a-handbasket’ escapist fatalism. Divine judgment becomes part of God’s redemptive purposes by which the universe is renewed and Christ’s compassion actually wins the day. Imagine ‘the final day’ as an all-pervasive truth and reconciliation commission where absolutely everything and everyone is put right in the Jesus’ way of restorative justice—where our shrunken dreams of temporal retribution gives way to God’s grand plan to include healing and deliverance, restitution and rehabilitation, redemption and restoration. Many within the reformed and evangelical traditions hold high the authority of the Bible, and such a tribe assents to the position that the Bible is the inspired, infallible and errant word of God. Those who uncritically accept such a position often fail to see that they dwell within an ethos that works, in fact, with two levels of authority. There is the Bible that acts as a formal and material source of authority (de jure) and there is the interpretive and factual (de facto) reality that is also authoritative. The Bible must always be interpreted, and it is in the interpretation (often not reflected upon) that a second or deuterocanonical form of authority emerges. There are many who naively assume that their interpretation of the Bible has the same authority as the Bible. In short, the Bible as authority (de jure) equals the authority of their interpretation (de facto). curving their roots around and under solid granite. singing notes that called into being these very notes within. And that of the sea to which it flows. Nearly two decades in the works, John Van Vloten’s The Unlikely Alchemist has finally hit bookshelves. In short, this is a very well written piece of children’s fantasy literature. Readers who watch for quality work in the genre of Lewis’ The Lion, the Witch and Wardrobe should be delighted. The Unlikely Alchemist includes some essentials in Christian fantasy literature—a self-consistent alternate world, the mysterious means of arriving there, a fellowship-style quest and of course, strong character development in the child antiheroes and their seemingly unbeatable nemesis. "As the last stage in the divine descent (katabasis) and self-emptying (kenosis), the descent of Christ into Hades became at the same time the starting point of the ascent of humanity towards deification (theosis). Since this descent, the path to paradise is opened for both the living and the dead, which was followed by those whom Christ delivered from hell. The destination point for all humanity and every individual is the fullness of deification in which God becomes ‘all in all’. It is for this deification that God first created man and then, when ‘the time had fully come’ (Gal. 4:4), Himself became man, suffered, died, descended to Hades and was raised from the dead. "We do not know if every one followed Christ when He rose from hell. Nor do we know if every one will follow Him to the eschatological Heavenly Kingdom when He will become ‘all in all’. But we do know that since the descent of Christ into Hades the way to resurrection has been opened for ‘all flesh’, salvation has been granted to every human being, and the gates of paradise have been opened for all those who wish to enter through them. This is the faith of the Early Church inherited from the first generation of Christians and cherished by Orthodox Tradition. This is the never-extinguished hope of all those who believe in Christ Who once and for all conquered death, destroyed hell and granted resurrection to the entire human race." In my travels I often minister in places where people’s expectations of God’s intervention to bring healing or any kind of transformation are low. This is usually because they’ve suffered big disappointments: praying for friends and family who haven’t been healed but remain ill or in pain, or have died and not been resurrected. Disappointment naturally leads people to accommodate to the status quo. We too often adjust our theology and practice to make room for prayers not being answered. when the wind moved through the valley. you weren't listening at the time. silver into the sleeping lake. That's when you began to shimmer. See how the waters wait for your voice's ripple. See how the still waters shine back the light. Several years ago, the superior of the Missionary Oblates of Mary Immaculate in Rome asked Fr. Ronald Rolheiser to compile a list of the major spiritual questions bubbling in the Catholic world, based on his experience as a writer and speaker. At NCR’s request, Rolheiser recently took another look at that list, bringing it up to date in light of what he’s seen and heard in the intervening period. The following is the “Top 10” list Rolheiser put together in late April. 1. The struggle with the atheism of our everyday consciousness, i.e., the struggle to have a vital sense of God within secularity, which, for good and for bad, is the most powerful narcotic ever perpetrated on this planet; to be a mystic rather than an unbeliever. 2. The struggle to live in torn, divided and highly polarized communities, as wounded persons ourselves, and carry that tension without resentment, to be healers and peacemakers rather than simply responding in kind. 3. The struggle to live, love and forgive beyond the infectious ideologies that we daily inhale, i.e., the struggle for true sincerity, to genuinely know and follow our own hearts and minds beyond what is prescribed to us by the right and the left, to be neither liberal nor conservative but rather men and women of true compassion. 4. The struggle to carry our sexuality without frigidity and without irresponsibility, i.e., the struggle for a healthy sexuality, to be both chaste and passionate. 5. The struggle for interiority and prayer inside of a culture that constitutes a virtual conspiracy against depth and serenity -- to keep our eyes set against an infinite horizon. 6. The struggle to cope with personal grandiosity, ambition and pathological restlessness, inside of a culture that daily overstimulates them -- to live inside the torment of the insufficiency of everything attainable and to accept that in this life there is no finished symphony. 7. The struggle to not be motivated by paranoia, fear, narrowness and overprotectionism in the face of terrorism and overpowering complexity, to not let the need for clarity and security trump compassion and truth. 8. The struggle with moral loneliness inside a religious, cultural, political and moral diaspora, to find a soul mate who sleeps with us at our deepest level. 9. The struggle to link faith to justice, ecology, and gender -- to get a letter of reference from the poor. 10. The struggle for community and church, the struggle to find the healthy line between individuality and community, spirituality and ecclesiology, to be both mature and committed, spiritual and ecclesial. "Come Out My People! ": God's Call out of Empire and Beyond by Wes Howard-Brook (Maryknoll, N.Y.: Orbis Books, 2010) xvii, 525 pp, $30 USD. A review by John Dear, S.J. ground to softness by weather. and listen to my whispered lament. that bind it to my own. If I can unite in myself the thought and the devotion of Eastern and Western Christendom, the Greek and the Latin Fathers, the Russian with the Spanish mystics, I can prepare in myself the reunion of divided Christians. From that secret and unspoken unity in myself can eventually come a visible and manifest unity of all Christians…. We must contain all divided worlds in ourselves and transcend them in Christ. The centre of Thomas Merton Studies in Canada, since the historic 1978 ‘The Thomas Merton Symposium’ in Vancouver, British Columbia, has been on the West Coast. The Thomas Merton Reading Room is at Vancouver School of Theology (where the symposium was held), and most on the national executive of the Thomas Merton Society of Canada (TMSC) live on the West Coast of Canada. There is, therefore, a thriving interest in Merton on the West Coast of Canada. There have also emerged in the last decade from the West Coast two challenging books from the probing mind of Hans Boersma from Regent College: Nouvelle Theologie and Sacramental Ontology: A Return to Mystery (2009) and the more popular Heavenly Participation: The Weaving of a Sacramental Tapestry (2011). These two books have brought into sharp focus the essential role the 19th-20 century New Theologians of the Roman Catholic church played in calling the church back to her grounding, rooting and ancient sources of renewal. The Roman Catholic tradition had become stalled and frozen, in many ways, in the Tridentine paradigm and confessional commitment, between the 16th century and Vatican II. There was a narrowing between Trent and Vatican II within the much fuller and deeper Roman Catholic way. The earlier 16th century humanists such as John Colet, Thomas More, Erasmus and Juan Vives, for example, had a broader understanding of their faith than Tridentine Catholicism. Erasmus was even put on the Index at Trent and remained there until Vatican II.